The robotic cleaning industry gets a boost with the iRobot Roomba 770. Since 1990, the roboticists of Massachusetts Institute of Technology have been delivering state-of-the-art advance lifestyle-enhancing concepts. The iRobot Roomba 770 delivers efficient cleaning for pennies on the dollar. it sleek, new look, an upgrade from the earlier 500 series, also includes newer technology based on study groups and customer feedback. it craftsmanship and ease of use transforms the price tag into a self-paying investment. Launched in 2011, this product promises to clean under the edges and rough spots as it delivers a cleaner, better breathing environment thanks to its leading filtering system. The iRobot Roomba features Auto Virtual Wall® barriers keeping the system in the areas you need it the most. Also, the dual HEPA filters deliver a cleaner breathing environment. Now with an extended battery life, lasting 50% more than its predecessors, you can truly count on the Roomba 770 to give you greater cleaning for your money while saving energy and the hassle of constant battery recharging. This automated cleaning system will pick up fine particles traditionally excluded from brooms, mops, as well as other automated cleaning systems in the market. Two years into the market, the iRobot Roomba 770 became the best-selling cleaning system from the iRobot family, and it is still a sound investment within the purifying cleaning robotic industry. iAdapt Responsive Navigation technology The iRobot Roomba 770 monitors for cleaning needs more than 60 times per second, as well as detects for walls and cliffs, ensuring your furniture and belongings are delicately during the sanitation process. The product does not clean in a structured pattern, but it sure cleans to the micrograms wherever it lands. In the end it does deliver. ​Easy to use control pad Very user-friendly, control the iRobot with your fingertips. Press the “Clean" button to start cleaning, keep it pressed to turn it off. Other settings follow the same ease of use. ​Self-charging battery It can’t get better than a piece of technology that runs to the nearest recharging station on its own. This iRobot will remain ready and on fully charged for the following cleaning. Dual HEPA filters- remove dust, dander, pet hair and particles. The bin can fill up pretty quickly. The model comes with an extra set of HEPA filters, among other accessories. Scheduled cleaning the iRobot Roomba 770 can be scheduled for cleaning seven times a week, offering a great return on investment. It will give years of thorough and deep cleaning when used according to manual specifications. To schedule cleaning, just turn it on, press “clock", enter the day and time (up to seven days) and press OK to save changes, it’s that easy. The more you use your Roomba the better it will work for your living environment or place of business. Quieter than the earlier 650 model yet the noise indicates it is working powerfully. In any event it is not louder than a hair blower. The iRobot Roomba 770 is a thorough cleaning machine designed to purify as it cleans the designated area. Aerovac Series 2 bin features a powerful vacuum that pulls debris, hair and dander into its compartment. As with any automated cleaning device, bigger objects should be removed from the intended area before initiating the cleaning session. Its random path provides better cleaning although it could seem contradictory, the back and forth and circular motions of the iRobot Roomba 770 ensure a greater coverage and a thoroughly cleaning area. It has a “Spot Mode" as one of its three cleaning modes, that will spiral about three feet or one meter in diameter for intense, localized cleaning. Patented three-stage cleaning system Its spinning side cleans around the edges and the counter-rotating brushes are part of its powerful AeroVac system. Dirt Detect System 2 a combination of acoustical and optical sensors to detect grime and light touch bumpers. The iRobot 770 will pick up dirt and particles in excess of 96%. ​Anti-tangle system this model will not tangle in tassels. As soon as it detects a tangle, it will revert its brushes to untangle itself. You can leave home with peace of mind, schedule your cleaning, and let the Roomba 770 do your work for you. ​Compact Home Base Roomba 770 will return back home for charging. It will always be ready and available for the next sanitation session. Remote controls As if cleaning in auto mode is not easy enough, the model features a remote control. No need to get up to turn it off. 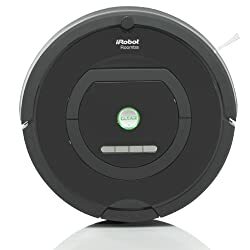 The iRobot Roomba 770 is available online via Amazon, Best, Costco, Home Depot, Military Exchanges, Sam’s Club, Wal-Mart, Target, JC Penney, Home Shopping Network Bed Bath and Beyond, and in the company website where special discounts are available. Manufacturer price is $499. To ensure a quality product, buy from authorized retailers. The iRobot Roomba 770 offers thorough and professional cleaning power for your investment. lt long-range of features excels not only over earlier models but over cleaning bots offered by other brands. The iRobot 770 sweeping, circular and back and forth motion ensure areas are thoroughly clean. The sleek design and improved technology over its predecessor, purifies the air as it sanitized the dwelling or business environment. This model is able to come in and out of troublesome places with virtual simplicity. Some reviewers will argue it has trouble with getting from traditional floors to carpet. According to its user’s manual, Roomba will easily adapt from wood, carpet, vinyl and linoleum It needs a clearance of about 3.6 inches. It will also speak other languages, to change the language, press “clean" (turn it on) and then “dock". Then press “clean" repeatedly until you get your desired language. The model will work best when used often. Not designed to be used outdoors, iRobot offers 30 day satisfaction guarantee or your money back.